As I watch some of the developments in Afghanistan, I am concerned that we are approaching this conflict more as a "police action" than as a war against very real, deadly, and persistent enemies. We approached another war in our recent history as a "police action." That was Korea. We ignored the advice of one of our greatest generals when he admonished the Congress, "In war, there is no substitute for victory." Was he right? Well, more than 50 years later, we still have tens of thousands of American troops in South Korea, on constant alert against invasion from an enemy we chose not to defeat a half-century ago. China has announced it wants to establish a military presence in the Middle East during the next decade. It wants to position itself closer to the strategic materials it secures from suppliers in the Persian Gulf region, i.e. oil and natural gas. China apparently feels the need to protect those investments and guarantee access to those resources. Could this be the beachhead for events predicted by John in the Book of Revelation? 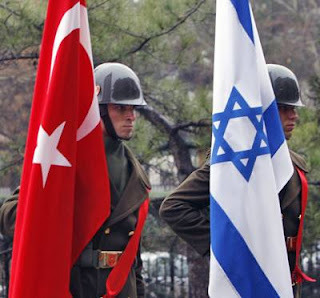 The normally cordial relations between Turkey and Israel have taken a beating in recent months. They have suffered at the hands of Turkey's Prime Minister Erdogan, one of the leaders of the Islamist AK party. Of course, a couple of far right members of Netanyahu's cabinet haven't helped the situation with some recent grandstanding of their own! Turkey has been Israel's only Islamic ally during the last several years. The two nations have even enjoyed joint military cooperation since 1995. But it now appears that the Muslim elements of Turkey's secular government are beginning to take control. As a result, they are pushing Israel out of the relationship and strengthening Turkey's ties with Lebanon, Syria, and Iran, just as Ezekiel predicted. You know that Israel is one of the tiniest nations on earth, both geographically and population-wise. You also know that it is surrounded and hopelessly outnumbered by hostile nations that have repeatedly tried to annihilate the tiny state. But did you know that Israel is also one of the most advanced and sophisticated weapons manufacturers in the world? And they are particularly skilled at producing 'unmanned' machines to make the battle easier. Sixty years ago, the Israelis were a backward, agrarian society fighting off their enemies with war surplus material scavenged from around the world. Now, their goal is to produce machines to fight the battle for them. In fact, an Israeli engineer invented the unmanned flying drone that is now such a critical tool for American forces. The Israelis are determined to limit the number of casualties their forces suffer -- in part because their population is so small and thus their force strength is severely limited. Could it be that God has given His people a special ability to excel in this area? That certainly fits with the Bible's prediction about their self-defense in the face of overwhelming odds. Finally, the almost unbelievable tragedy and suffering we're witnessing in Haiti reminds me that we are rushing headlong toward the final days of this Age. Jesus Himself said that as the time of His return approaches, these events will occur with greater frequency and intensity than ever before. It's time for all Christians to heed the parable of the Good Samaritan and do everything we can to alleviate the suffering of these victims, the poorest of the poor. But it's also time to make certain we and our families, friends, neighbors, and co-workers are prepared to answer the call when Jesus shouts, "Come up here!" I'm convinced that may happen at any moment now.